Rookie Nick Foles will try to end the Eagles woes Sunday, as Philly travels to the Nations Capital to take on Robert Griffin III and the Redskins in a NFC East battle. Philadelphia (3-6) and Washington (3-6) have a rivalry that dates back to 1934, with the Redskins holding the all-time advantage at 79-70-5. Last Sunday the Eagles lost to the Cowboys 38-23, pushing the Philly losing streak to five games – the longest in 14 seasons under head coach Andy Reid, who is seven games away from having to look for a new job. QB Foles may be the Eagles’ quarterback of the future, but Reid – under pressure from owner Jeffrey Lurie since the start of the season – may not be a part of it. Philadelphia is underachieving again, and on the verge of its first six-game slide in a single season since concluding 1994 by dropping seven in a row. Barring a staggering turnaround, the Eagles are headed for a second straight season out of the playoffs, which would also be a first under Reid. Griffin and the Redskins may be in a similar situation during a three-game losing streak, but they aren’t dealing with lofty expectations. They’re also refreshed coming off a bye following a 21-13 home loss to Carolina in Week 9, a game coach Mike Shanahan deemed “must-win” before suggesting the playoffs were out of reach. An NFC East-heavy schedule is partly why that message has changed. After hosting the Eagles, the Redskins visit second-place Dallas on Thanksgiving before welcoming the division-leading New York Giants to FedEx Field on Dec. 3. Improvement from Griffin may be key to getting back in the division hunt. The top pick in last April’s draft has completed 53.4 percent of his passes for 392 yards with one TD over the last two games, while gaining 61 yards on 17 carries. 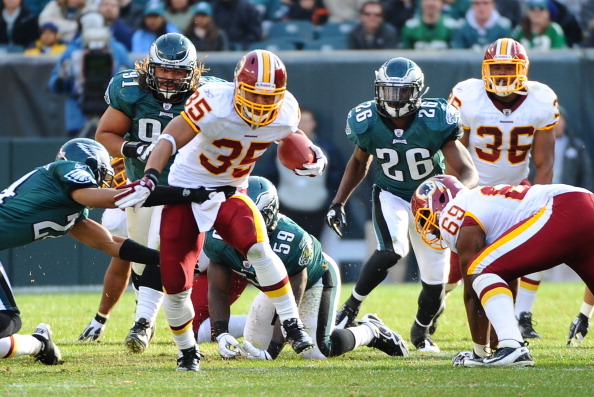 Griffin had averaged 66.9 rushing yards with six TDs in his first seven games. Still, he has a 93.9 passer rating, tops among rookies and good for ninth overall in the league. Washington’s defense remains one of the worst in the NFL, surrendering an average of 397.9 yards – 301.7 through the air, although it may get a boost with safety Brandon Meriweather expected to make his season debut after recovering from a knee injury. Those numbers still may bode well for the Eagles, who are averaging 223.0 passing yards in seven games since getting a season-high 357 in a Week 2 win over Baltimore. Jeremy Maclin is encouraged with what he’s seen out of Foles so far. The receiver hauled in a season-high eight passes for 93 yards last week, including a 44-yard touchdown from the rookie. He topped 100 yards each time while the Eagles won both meetings with Washington last season. “He can throw the ball in places, put the ball in certain places, not most guys can do in this league,” Maclin said. “When he got into the preseason, the poise that he showed, it’s not what most rookie quarterbacks show. Griffin should have an extra weapon with receiver Pierre Garcon slated to return after a troublesome toe injury. Washington is playing better than the Eagles right now, and while Philly should lead on LeSean McCoy a lot, they want to see what Foles can do, and I think the Skins D will do enough to get the Redskins the Win.